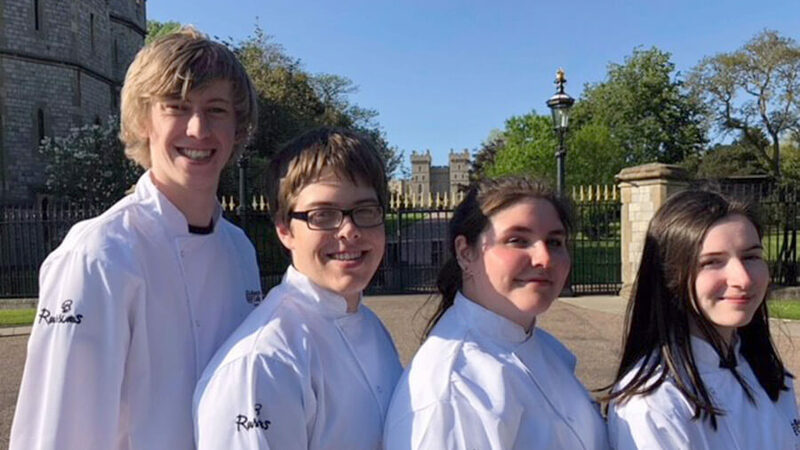 Four of our Catering and Hospitality students had the fantastic opportunity to spend a week as part of the catering team at the Royal Windsor Horse Show. We asked them to keep us up to date with what they are doing and they didn’t disappoint. Read their accounts of how they got on – and we don’t have to say how proud we are of their hard work and dedication! So today was the journey down to Windsor from college. It was a really long journey but we travelled in the Barnsley College Sports Academy mini bus (thanks by the way for letting the catering and hospitality department use it) which is a 16 seater. As we are only 4 students there was plenty of room! When we got into Windsor we collected our passes to get through security. We had a tour of the kitchens and premises and met some of the other chefs and various other team members. My favourite part of the day was looking around the grounds and getting to see behind the scenes of the event. We saw where the royal family will be eating and the actually seat the Queen will be sitting in. We’re currently getting ready and preparing for our first day on the job tomorrow and we will keep you updated. Day 2 – The day of the big cheese! 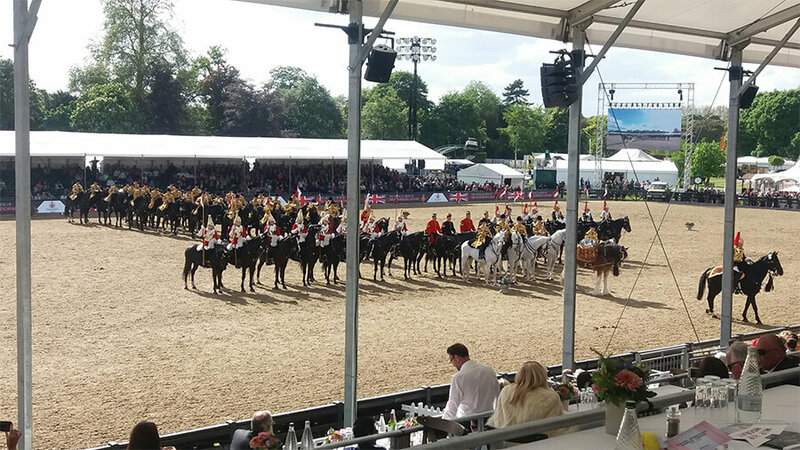 Today was our first day working for Compass at the Royal Windsor Horse Show, Martyn Hollingsworth (head of the catering and Hospitality Department) and myself were in the kitchen that prepares and serves food for members of the show. In the morning we prepared the desserts for service as well as mucking in doing odd jobs. During service I was sending main courses to table with another chef. There was a mix up with the cheese delivery and the cheese deliverer accidentally sent us Gordon Ramsay’s cheese. We used it anyway but I’m praying for the delivery driver if Mr Ramsay ever gets his hands on him!! Everyone in my kitchen is so lovely, supportive and helpful so they made the day really nice. My highlight of the day was definitely sending some mains independently, although keeping on the ball for 12 hours straight is a challenge but one that I overcame and am getting the hang of. Meanwhile, back in the other kitchen our students managed to grab a few minutes from their food prep to watch a rehearsal for the show. Today I have been working with a team of 4 chefs, including myself. It has been a massive prep day for tomorrow, as well as prepping for the sea food box stand. We had to shell over 80 lobsters in total. 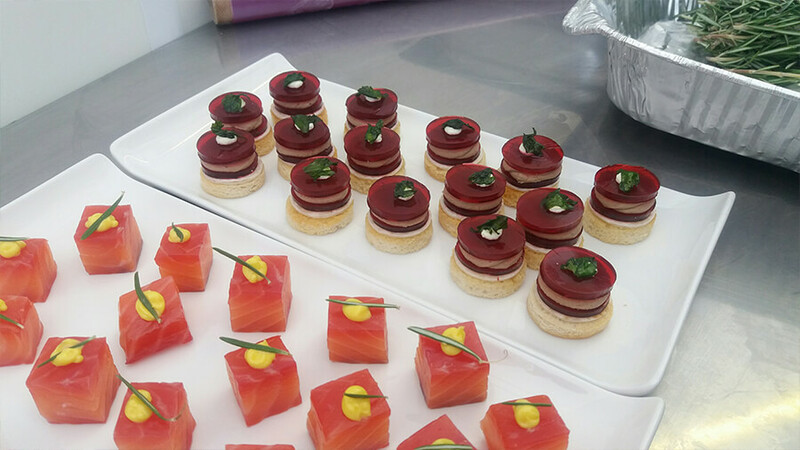 I also finely sliced 5 sides of salmon and smoked haddock, and prepped fruit for the fruit platters. I found the lobsters challenging as I’ve never done it before and the meat doesn’t hold together or come out of the shell easily! I enjoyed doing the fruit platters most. We met a lot of interesting people such as the Lord Lieutenant and the Queen’s private butler. I’ve also been able to see the horses performing as my kitchen is looking down on the main arena. Day 3 – Our 14 hour day! Today was the longest and hardest day so far we did 14 and a half hours in total, we’re all shattered. I’m currently sitting on the floor waiting for my roommate and fellow student James Hutchinson to come out the shower so I can hop in and try and wash some of the aches away. Today was similar to yesterday except I did things more independently and actually fitted in as part of the team as apposed to a student they have to supervise. Unlike yesterday we had to produce platters for a small party of people and today’s service was longer and busier as the weekend is getting closer. 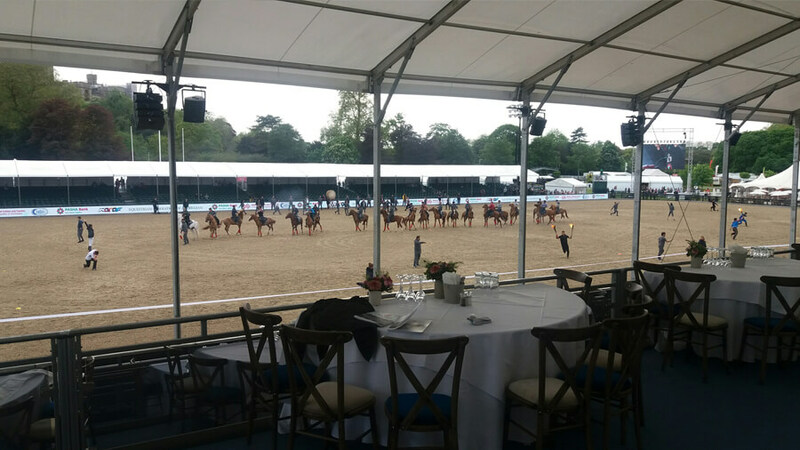 My favourite part of the day was after we had finished we got to watch part of the horse show and see the riders perform tricks and wave fire around (those guys are really talented by the way!). My feet are starting to ache now (despite having insoles in my shoes) so that was definitely the hardest part. Tomorrow is apparently going to be even busier, so we’re just about to go to bed so goodnight and I’ll update you tomorrow. Today has been the first day I was out of the kitchen! I’ve been serving food in 2 boxes and the viewing balcony to the show. Today we have done 14 and a half hours! It was longer than expected as I had to help out in another kitchen under the pastry chef. 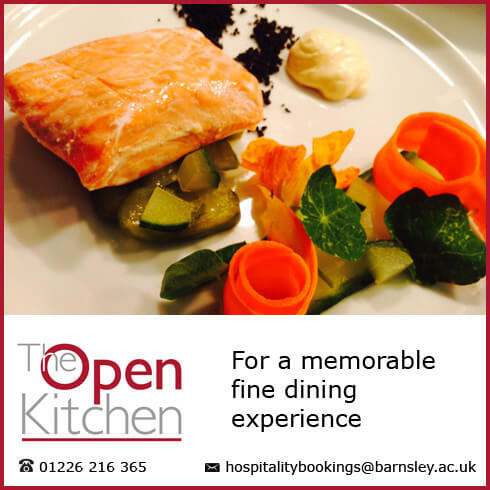 We have prepared food for hot and cold buffets including meat and fish platters, mini short rib and hake. I found it challenging with the longer shift and going into new kitchen environment but I’ve had a great time. Hello it’s Lucy Pennington. On day three I was in the members’ kitchen preparing food for the starters, plating them up and garnishing for service. It was very busy and a fast paced environment but was fun to do as I was surrounded by really positive staff who knew I was a student and wanting to learn. 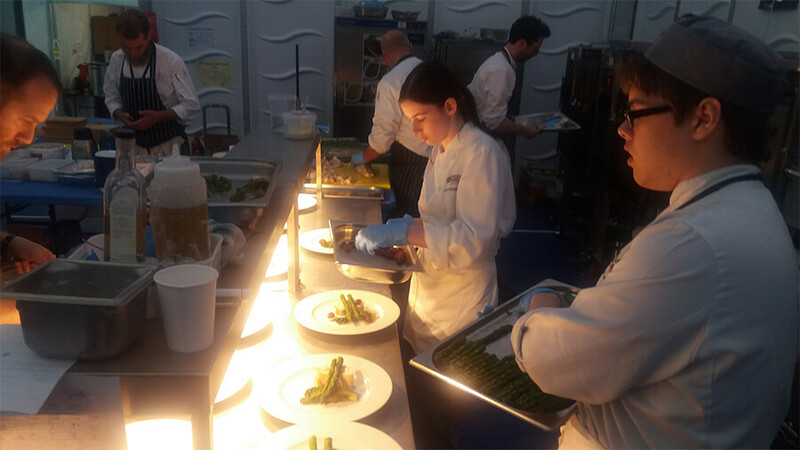 In the evening I went into another kitchen where the other students, Lucy, Declan and James, and I were in charge of plating up the food for the private boxes, for example the Royal Box, Bahrain and Rolex. We didn’t finish till 9.30pm so we’re all very tired and I think most challenging aspect of this experience is working for 14 hours a day. Along with doing my regular jobs throughout the day, this evening we went down to the main kitchen to help serve the Royal Box. The main dish was monkfish with asparagus and salted grapes and the dessert was a bay leaf panna cotta with lemon curd, blackberries and nuts and a drizzle of olive oil. We worked with the Head Chef and other Senior Chef to plate up the meal. I managed to catch a glance the Queen whilst she was enjoying the horse performance. It was a challenging day as the kitchen is very open and a cold wind was blowing straight through making serving hot food impossible. 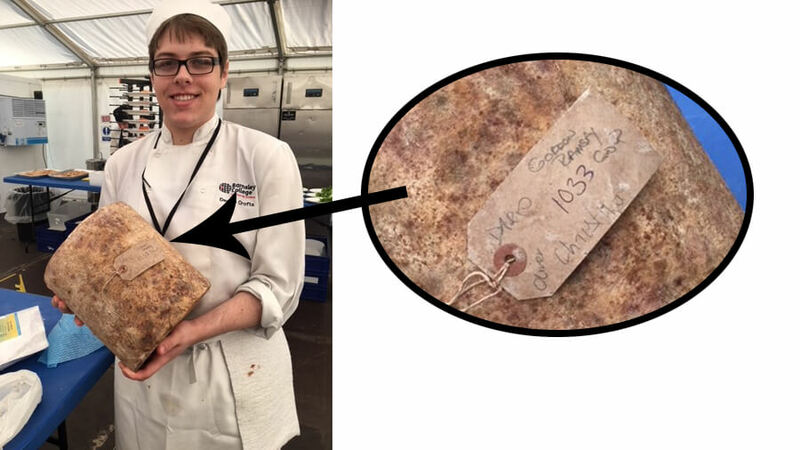 The pastry chef Sofia has been kind enough to allow us to use her recipes when we recreate the menu back at College. Today was the day we had all been waiting for as the Queen hosted her meal in the Royal Box. The day normally starts with the service of breakfast and lunch in the members’ area to a total of 550 guests. 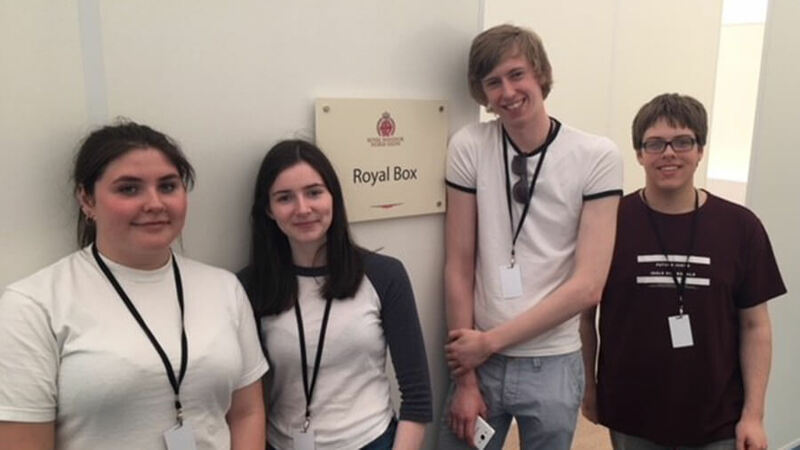 My fellow students and I then went and helped send food to the Royal Box. We were under the eye of Bryn Williams, a one Michelin star chef and star of BBC2’s Great British Menu programme, and we all had our photo taken with him. I’m having a really nice time and feel like an actual cook in a proper establishment rather than a catering student on a College trip. After 15 hours of hard work our feet and backs were starting to ache but we powered through. Day 5 – A busy weekend! As it was Saturday, this was the busiest, and most physically and mentally straining and challenging, day yet. 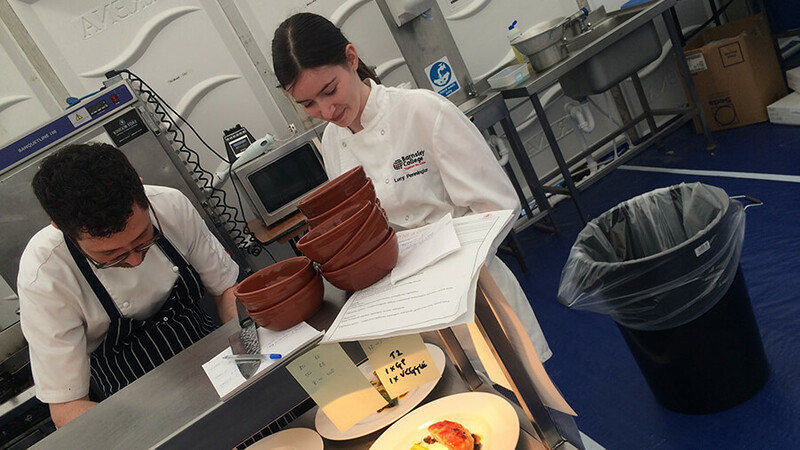 We did over 500 covers with only two of us on the main course section which shows how hard we worked. My highlight of the day came on a trip back from the outside freezer. One of the chefs pulled me over, pointed at my pass and said, “You’re really good you know”. As little as it may be, that comment really made me happy because I work so hard and put everything into what I do. For someone to compliment me like that was really nice and that was just really nice of her and the fact she has been a Compass Group UK member for around five years made the comment resonate. It has been an amazing experience which I’d happily do again. 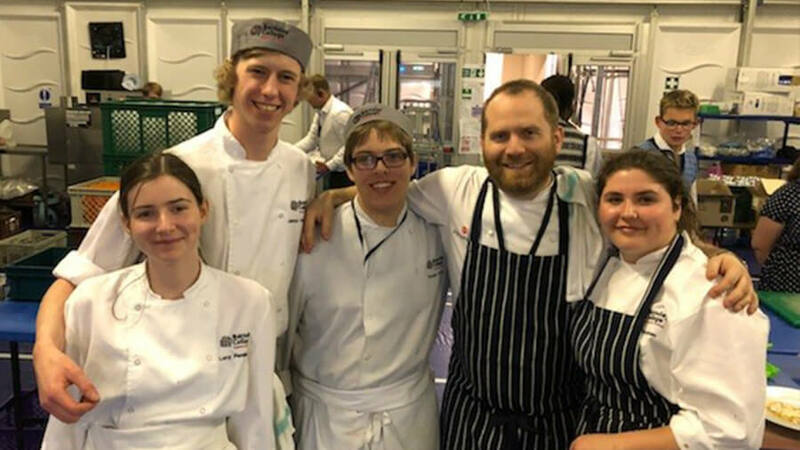 It is really hard and challenging but it’s been lovely to work amongst great, lovely and talented chefs, pot washers and waiters/waitresses in my kitchen – I’d particularly like to give a shout out to Wes, Chantelle, Duffy and Adrian. It was an honour being part of the team that cooked for the Royal Box which included the Queen and I am really proud of all of us who came down here and did the 15 hour days and 5.30am starts. Thanks again to the College’s Catering and Hospitality department for providing us with this life-changing opportunity, thank you to Russums for providing us with our sponsored jackets, to all the amazing people at Payne and Gunter and Compass Group UK and the staff that earned their money at the show. I can honestly say that I was sad to leave Windsor, I have enjoyed every minute of it. I’ve never done anything like this before and I’m so honoured that I got picked to go. The hours were long and I’m aching all over but I would do it all again in a heartbeat, I’ve met so many amazing, kind people who welcomed me and involved me in everything. I was dreading being in a kitchen all by myself with strangers but it’s been one of the best experiences of my life and I’ll never forget the people I met and the long hours we shared. I’m telling anyone that will listen that I got to cook at Windsor Castle. I’m also so proud of the friends I came with. They’ve done an amazing job and worked so hard to get here, every one of them deserved it and I’m glad I got to do it all with them. Thank you to our College tutors James and Martyn for putting up with us, and all my complaining, and thank you to everyone at the show. It’s been a hard week but we got through it and I couldn’t have done it without you guys. This has been a dream come true for me and I’m so grateful.